The greatest masters racing team of all time? I can see Roger Worthington now, seated atop a golden throne which is itself perched atop a mountain of tightly bound thousand-dollar bills, staring out the giant plate glass window of his mansion in Bend. As he casts his lonely eye upon the surrounding valley shrouded in snow, he cannot focus his attention on his immeasurable wealth, on his palatial eco-home that houses three people and has a carbon footprint the size of Beijing, or on his empire of craft beer, retail pizza establishments, and hundreds of thousands of acres of genetically modified hops. In 2015, everyone seems to be vying for the title of America’s Greatest Profamateur Masters Racing Team. Is it Surf City Cyclery with its cadre of hardened killers, customized bike stands, personal masseuses and wrapped RV? Is it Monster Media with its gnarled and vicious national champions, its color-coordinated team bikes and its capacious custom canopy? Is it SPY-Giant-RIDE with its 80-man team, each rider armed with his own personal collection of fancy sunglasses, and its omnipresent armada of rolling wrapped team vehicles? Alas and alack, it is none of these. The greatest masters racing team of all time was Labor Power. Driven by the power hungry and depraved mind of Max Kash Agro, this collection of weird, antisocial, and utterly bizarre misfits created the mold for the modern profamateur masters team and then smashed it, along with Max’s hip, irrevocably in 2006 — never to be recreated or even vaguely approached. The story began in 1983 or 1984 as I was pedaling around the track at Camp Mabry in Austin, Texas, when I first met Roger. He had an orange Viner. He raced a bit but aside from being reputedly “mean as a rattlesnake” there was little to suggest that less than a decade later he would burst onto the scene as the millionaire financier of Labor Power. By the time he had been evicted from Texas and relocated to his Shangri-La in San Juan Capistrano, he had already invented the key elements of the profamateur masters bike team: Fancy Euro car with a decal, garish team clothing, “deals” for the team members, and teamwork that even today few teams can begin to approach. In keeping with Roger’s ethos of “winning isn’t the only thing, it’s what I pay you to do,” Labor Power put together a cadre of racers who still make themselves known as the elite of the leaky prostates. Chris Walker, Louie Amelburu, Chris Hahn, and Greg Leibert are just three of the old Labor Power crew who still dominate when they show up to race. Others have gone on to their reward or faded from view: Chris Hipp dead, Dave Worthington retired, Mark Scott mostly retired, and Chris Hahn still racing but only when he feels like it. Among them, the stalwarts of Labor Power amassed a record that is truly beyond compare, and what’s more incredible, they did it without any real suspicion of doping. Consider this: In 1999 the team scored 40 wins and 78 podiums, including two state crit titles and a silver medal on the road. 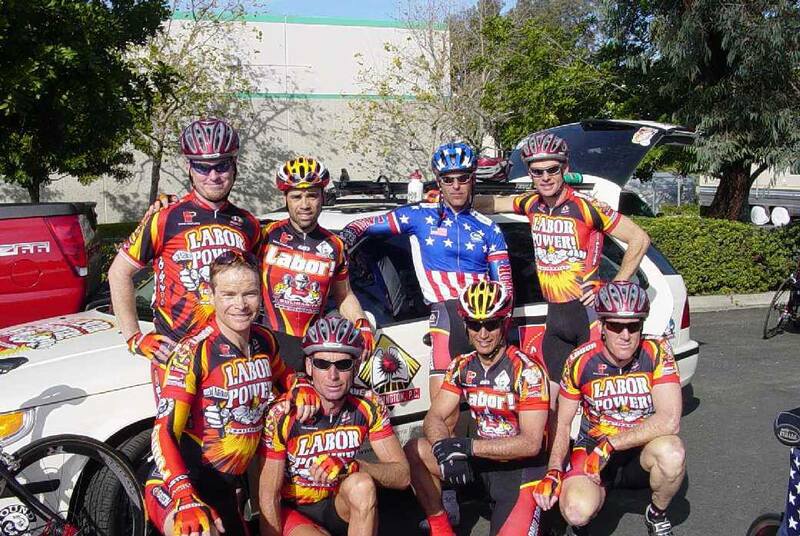 The next year Labor Power upped their tally to 42 wins and 95 podiums including state TT and road titles, wins at the Cascade Classic, and victories in every marquee masters event in California. In 2001 the team notched 42 wins, a world masters road title in Austria, and a gold medal at the Pan-Am masters championships. In 2002 Butch Stinson alone earned 31 victories as the team rolled up a mind-boggling total of 120 wins for the year. With 103 victories in 2003, the team had nothing left to win. So, dropping down to a “mere” 37 first place finishes in 2004, Labor Power masters racer Chris Walker won the elite men’s national road race at age 42. By 2005 the team was falling apart, and so was team leader Roger Worthington’s hip. Labor Power officially disbanded in 2006. What possibly explains this run of dominance, stretching from roughly 1995 to 2005? First of all, Labor Power’s guiding motto was “Win.” The team would block and sacrifice if it had a rider in the break, but that rider knew that 2nd place was unacceptable. There were no glory breakaways with Labor Power, where a rider finished sixth out of six riders as his team sacrificed in the rear. If you were going to ride the break you’d better not only have a plan to win, you’d better execute it to perfection. The fear of failure was driven by the manic despotism of MKA, and it worked. Second, Labor Power, with one or two glaring exceptions, didn’t take wankers. If you were a proven winner you might get a ride with Labor Power. There were no bro deals. If you rode on Labor Power it was because you were either a closer or you were a closer. People weren’t recruited because of their ability to help, or work, or fetch water bottles. They got a ride because they knew how to cross the line first. Third, Labor Power intimidated. They invented the cycling blog when things were still done on paper. The created the first mad-man race reports. The fecund and off-the-reservation mind of Roger Worthington made fun of everything, lampooned the enemy, lauded himself, and backed it up with vicious-but-fair, take-no-prisoners race strategy. Fourth, Labor Power was ugly. Their uniforms were designed by Chris Hipp, a guy who had zero artistic talent and several galaxies’ worth of racing ability. Matching Hipp’s bad art with MKA’s bad taste, Labor Power designed jerseys that are notable even today for their garish ugliness and brashly bad mixture of offending colors. Yet the ugliness had an effect: When you lined up against the twisted minds of Labor Power you not only had to deal with the yelling, the intimidation, the race savvy, the steely legs and the cunning minds, but you also had to try and un-see the awful combination of colors that makes Monster Media’s kits look almost attractive. Fifth, Labor Power had fun. It wasn’t the fun of “we gave it our best,” it was the fun of a gang of blood-soaked Mongol warriors, dripping in gore and sated from the spoils of razing a village, beheading the elderly, and selling everyone else off into slavery. Sixth, Labor Power had money. Roger, despite being one of the cheapest, most tight-fisted people on earth, knew that to run a masters bike team it would cost money, and to that effect he made sure that at the end of each year his racers received the tiny pittance in shared winnings that are enough to keep an elite old bike racer cozy and warm in a cardboard box. For the amount of money that masters teams spend today, Labor Power could have outfitted a small country of bike racers. So the next time you’re feeling good about your race results, or you’re thinking that the team is on its way to a winning season, take a moment to peruse the details of what is unquestionably the weirdest, whackiest, winningest masters racing team of all time: Labor. For $2.99 per month you can subscribe to this blog and wonder at the achievements of Labor Power. Click here and select the “subscribe” link in the upper right-hand corner. Thank you! You are currently browsing entries tagged with mka at Cycling in the South Bay.